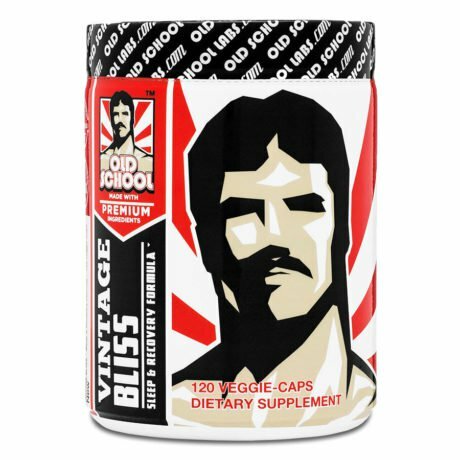 Vintage Bliss™ helps the body reach the non-REM, deep sleep, stage faster to stimulate both muscle growth and repair. 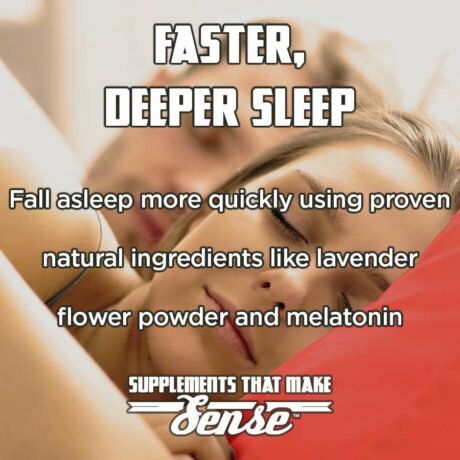 Vintage Bliss™ helps you get to sleep more quickly using proven natural ingredients like lavender flower powder and melatonin. These components begin working to ease you into a deep sleep the moment you lie down. With ingredients like valerian root powder to promote calm and glycine to support muscle repair, Vintage Bliss helps improve the quality of your sleep, allowing you to reap the most benefits from the time you spend sleeping. The unique Vintage Bliss™ formula is designed to promote muscle and nervous system recovery, so you wake up feeling revitalized and less sore. Vintage Bliss is part of our Health & Vitality supplements range. We created it because achieving a balanced, head-turning musculature should never come at the expense of your health. Non-REM sleep, aka deep sleep, is essential to your body and mind’s health. During the deep sleep stage, more blood and nutrients are pumped into your muscle tissue and your body releases growth hormone. This stimulates both muscle growth and repair. Without proper sleep, you can be severely compromising your diet and training efforts. Progress takes place when you are sleeping – yet most people don’t maximize the benefits of the sleep time they actually have. Vintage Bliss is a highly effective sleep and recovery formula designed to help you sleep better, recover faster, and reduce soreness. The carefully selected ingredients in Vintage Bliss help support quality sleep cycles while stimulating tissue repair. The result: you wake up feeling rested, refreshed, and less sore the next day. So stop wasting precious sleep time tossing and turning – and start getting the most out of each night with Vintage Bliss! At Old School Labs™, we set out from the start to be a premium and uncompromising brand, delivering exclusively premium products. We sell our products directly to you and are therefore able to afford including only the best quality ingredients in all our products. Press More to read about the ingredients you will find in Vintage Bliss™ in descending order of weight. An amino acid important in both strength and muscle recovery. Maintaining a proper balance of glutamine ensures that your stamina, strength, and recovery all benefit. 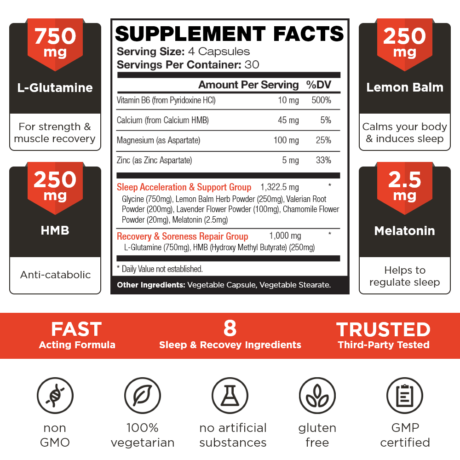 Natural metabolite of leucine which reduces muscle protein breakdown, leading to quicker recovery. 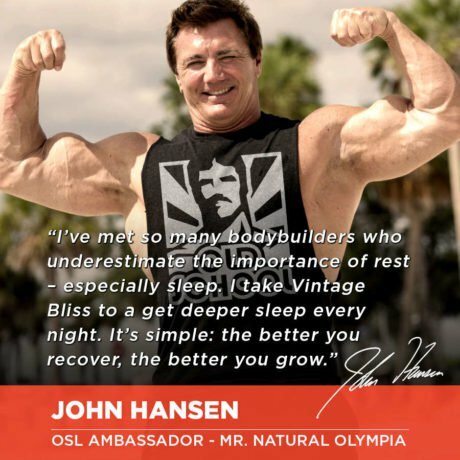 β-Hydroxy β-methylbutyric acid’s anti-catabolic effects help ensure that muscles do not break down during sleep. Produces a sedative effect, helping calm your body while inducing sleep. This promotes your ability to fall asleep more quickly and reach a deeper sleep. An amino acid essential in protein synthesis, which aids in quicker muscle recovery. 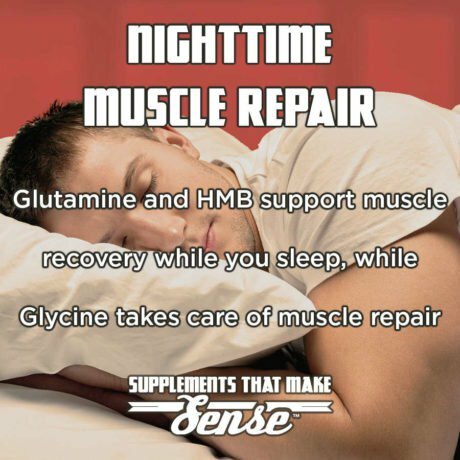 Glycine supports muscle repair during sleep. Promotes calmness and induces sleep. A plant powder known for its mental calming properties, it also helps with muscle and joint relaxation. A flower derivative that helps relax the mind and body to facilitate a deep state of sleep. A hormone responsible for proper sleep and a balanced sleep cycle. Helps to regulate sleep, allowing your body more time to rejuvenate. Vitamin responsible for the production of serotonin and norepinephrine, two neurotransmitters that have key roles in keeping your mind calm and your hormones balanced. Mineral needed by the body for proper function of the heart, nerves, and blood vessels. Helps support optimal health levels. Allows for nerves and muscles to function properly. When paired with zinc, magnesium also shows significant support of increased muscle mass, strength and increased metabolism. Important in muscle maintenance and growth. This mineral has also been proven to increase natural testosterone levels during rest and exercise. For use as a dietary supplement. Assess your tolerance with 2 capsules 30 minutes before going to bed. 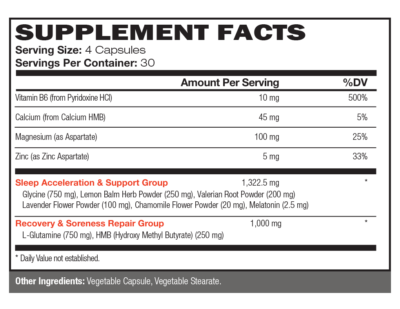 Regular serving is 4 capsules 30 minutes before bedtime. Allow for at least 6 hours sleep after consumption. Take 1 week off after 60 days of continuous use. Use only at bedtime and do not consume with alcohol. Consult your physician prior to using this product if you are pregnant, nursing, taking medication, or have a medical condition. Do not use if seal is broken. Keep this product and all supplements out of reach of children. Does Vintage Bliss™ cause dependency? No. 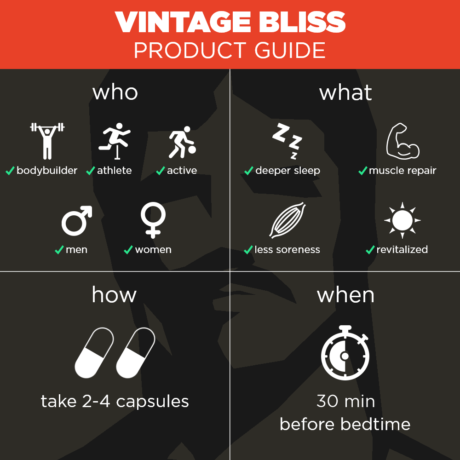 Vintage Bliss™ is a natural sleep aid that is not habit-forming. You can take the recommended dosage as often as you like without building dependency. However, we recommend taking a week off after 60 days of continuous use. Will Vintage Bliss™ completely knock me out? No. Vintage Bliss™ will help you to fall asleep faster and improve the quality of your sleep. Further, it will allow you to wake feeling refreshed at whatever time you get up. Is it OK to take Vintage Bliss™ on the same night after consuming alcohol? As with any sleeping aid, it is not recommended that you combine the product with alcohol. Will I wake up tired the next day after using Vintage Bliss™? No, you will wake up feeling refreshed and ready to go! You should not feel tired the next day as long as you allow yourself an adequate amount of sleep. Is Vintage Bliss™ suitable for both men and women? When should I take Vintage Bliss™? You should take Vintage Bliss™ about 30 minutes before going to bed.